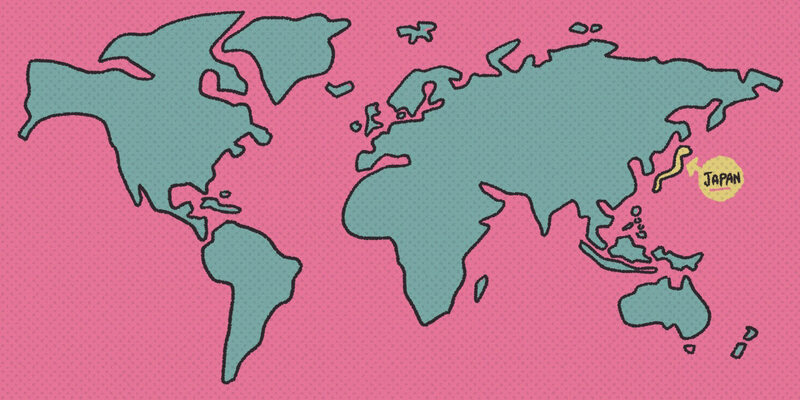 Whether written or spoken, most languages use the concept of counters. In English, for example, rather than "two dirts," you would use the phrase "two mounds (or piles) of dirt." "Pile" and "mound" are counters. Similarly, you'd refer to "three pieces of chalk" rather than "three chalks." In this case, "pieces" is the counter. The same concept holds true in Japanese. For example, if you're counting long cylindrical things, you would do so using 本 (ほん). One of those long things would be １本 (いっぽん); ten would be １０本 (じゅっぽん). But what if you're counting something flat? Rather than 本, you'd use 枚 (まい). To count three rugs, you would say ３枚 (さんまい). You'd refer to "three pieces of chalk" rather than "three chalks." In this case, "pieces" is the counter. 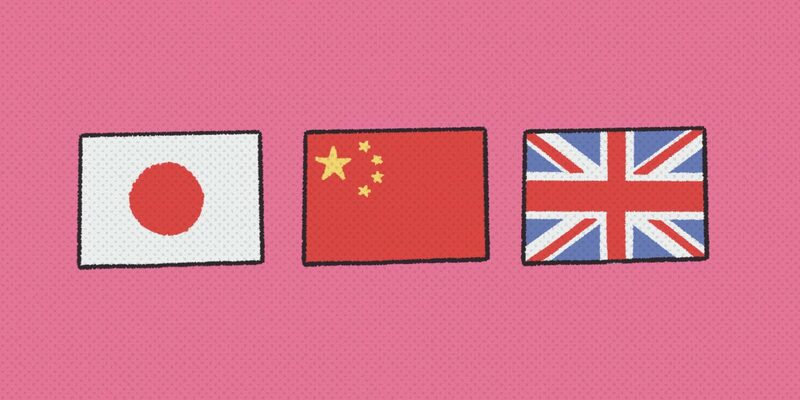 Your Tofugu pals have gone ahead and edited this down to 350 common Japanese counters you ought to know. If that's still too many, you'll be relieved to know that we broke that article up into various sections depending on how useful each counter is. You can probably live your life only knowing two counters (that's right, two), though we'd recommend learning at least the first nineteen or so. If you're already aware of these types of rules and simply want to learn about individual counters, our big list of Japanese Counters can help you. That's where we really get into counters like 本 (ほん), 枚 (まい), 台 (だい), 匹 (ひき), and many more. Prerequisite: Make sure you know how to read hiragana and katakana. We'll mention the "kango/wago/gairaigo counting method," and you can learn about all three of these Japanese numbering systems in our Counting in Japanese article. Knowing the kanji for numbers will help, too. In our example sentences and explanations, we equally use Arabic numerals (1, 2, 3) and Japanese kanji (一, 二, 三), since both are quite common in Japanese. 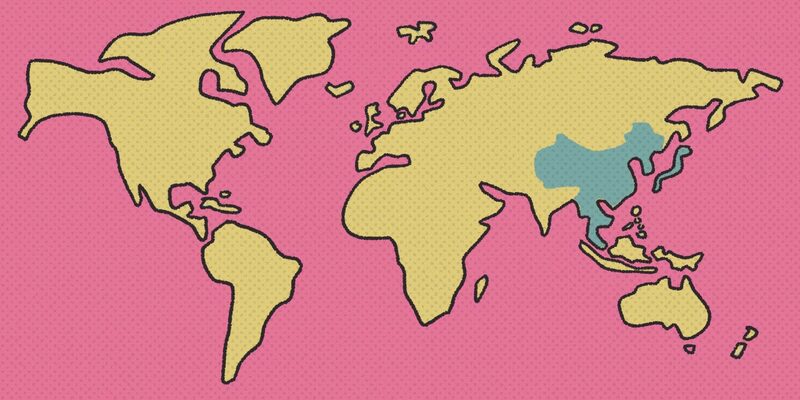 Before we get started, let's talk briefly about the origins of the Japanese language, of which there are three: wago, kango, and gairaigo. Wago words originated in Japan, kango words were imported from China, and gairaigo words were brought in from other places. Each uses different methods of counting—the chart below shows how each one works. The kango section should be familiar to you by now, and if not, please read our article on numbers and counting in Japanese. Why bring this up? It used to be that wago counters used the wago counting method, kango counters used kango, and gairaigo used gairaigo. Over time, however, kango's numbering system has become more influential and has taken over much of wago and gairaigo territory. Many wago- and kango-origin counters use kango for some or all of their numbers. That said, there are still plenty of exceptions you'll have to memorize; we review them in our big list of counters. Here, however, we'll show you just a few examples. Make sure you understand how to count counters using kango, since you'll be seeing it more than others. Because the kango counting method is the most common, let's start with it. While it's pretty straightforward, one thing to know right off the bat is that when counting in kango, four and seven usually use the wago numbering scheme: し (four) changes to よん because し sounds too much like 死 (also し), which means "death." しち (seven) often changes to なな because しち sounds too much like いち, which can cause confusion. That being said, しち is generally never wrong to use, and is often considered the "official" way to say it. But, "official" and "what people actually do" don't always line up. なな is probably more common, especially in daily conversation. Also, the number nine is usually read as きゅう instead of く, which has nothing to do with wago or kango; it's just that く sounds like 苦 (く), which means "suffering." There are exceptions to these rules as well, which we'll mention in our counters list and/or the individual counter articles as they come up. Some numbers and counters may be affected by systematic reading changes—いち, for example, may be shortened to いっ—but we'll cover that later. For now, make sure you understand how to count counters using kango, since you'll be seeing it more than others. Although kango is by far the most common counting method, there are some important (and not-so-important) counters that still use the wago counting method, though very few use wago all the way from one to ten. Nothing uses wago from eleven onward, with the exception of certain ages (twenty, thirty, and sometimes forty) and days (twenty). Otherwise, numbers from eleven forward will always be wago-free. The biggest and most important counter that uses wago is the general counter for "things". It uses wago all the way through "ten things." They are １つ (ひとつ), ２つ (ふたつ), ３つ (みっつ), ４つ (よっつ), ５つ (いつつ), ６つ (むっつ), ７つ (ななつ), ８つ (やっつ), ９つ (ここのつ), １０ (とお). We're not going to spend time here talking about this counter. For more, read our much-more-thorough 〜つ Counter article instead. When you're counting days, almost all use the wago counting method, except the first day, which uses the kango: １日 (いちにち), ２日 (ふつか), ３日 (みっか), ４日 (よっか), ５日 (いつか), ６日 (むいか), ７日 (なのか), ８日 (ようか), ９日 (ここのか), １０日 (とおか). Besides that, no other genuinely useful counters use the wago method with little or no kango intervention. Speaking of which, quite a few useful counters use wago partway before kango takes over. You'll need to memorize them. Some are so common that, in time, you'll begin to recognize them on your own. Counting people, for example, starts with the wago counting method for the first two, and switches to kango after that: one person is 一人 (ひとり), two people are 二人 (ふたり), but from three people on, it's 三人 (さんにん), 四人 (よにん), 五人 (ごにん), and so on. Even the counter itself (人) changes from the wago counter (り) to the kango (にん). Counting train, bus, and other stations is another example. For the first two, its counting method uses the wago: one station is 一駅 (ひとえき); two stations are 二駅 (ふたえき). Three stations, however, is 三駅 (さんえき), and it continues from there with the kango counting pattern. You'll find many other examples like these. You'll be better off reading about them individually, so let's move on to the final style. Gairaigo counters are our last category. Often we just use the kango counting method, especially for numbers higher than ten, presumably because most Japanese people know how to count to that point in English. For example, the セット (set) counter can use the gairaigo counting method, making it １セット (ワンセット), ２セット (ツーセット), ３セット (スリーセット), ４セット (フォーセット), ５セット (ファイブセット), ６セット (シックスセット), ７セット (セブンセット), ８セット (エイトセット), ９セット (ナインセット), and １０セット (テンセット). Be careful not to change セット to セッツ (the plural version of "set"), or Japanese people may get confused. When counting with gairaigo, when do you use kango and when do you use gairaigo? The answer is memorization: you'll need to know what's most common. And even if a word uses gairaigo, it can usually be replaced with a kango number instead. You could, for example, easily say いちセット for １セット instead of ワンセット. Luckily, there are rules that exist when certain numbers come into contact with certain phonemes. For the most part, they're fairly consistent, without a lot of exceptions. Starting to feel a little more comfortable with counters? As you learn more Japanese, it's probably easiest to remember the kango counting method and use it, although be aware of reading changes that occur depending on the number, counter, and combination of the two. For example, with the counter 個 (こ), you wouldn't read １個 as いちこ. Instead, いち would change to いっ, making it いっこ; same with ６個 (ろっこ) and １０個 (じゅっこ). Besides shortening, some numbers rendaku: ２匹 (two small-to-medium-sized animals) is read as にひき—nothing odd about that. But ３匹 isn't read as さんひき, as you'd expect—instead, it's さんびき. And if that's not weird enough,１０匹 is read as じゅっぴき! To better understand this table, let's trace the pronunciation changes for two different counters. The Japanese counter 個 starts with a k-sound, so head to the "k-" column of the chart. As you can see, when you have 1 個 of something, the 1 gets shortened from いち to いっ, making it いっこ. Moving down the table, notice that 2 doesn't exist. That's because 2 doesn't have any systematic reading changes. 2 is always に, and the counter always stays the same. ２個 would be にこ. It's the same for the other missing rows (5, 7, and 9)—though keep in mind the rules we mentioned earlier in which 7 is often なな, and 9 is often きゅう. Next up is 6, 8, 10, and 100. They all get shortened, as you can see. No matter the number, the "k" will always be a "k." It won't rendaku to a "g" sound or anything like that. This one is a little more complicated. Every row has some kind of change. Still, the numbers 2, 5, 7, and 9 are safe, which is why they aren't in our chart. １匹 shortens いち to いっ. In addition, ひき changes to ぴき, making the reading いっぴき. ３匹 doesn't shorten the さん (3 never gets shortened), but the h-sound changes to a b-sound. Luckily, this is consistent: no matter what the counter is, an h-sound changes to a b-sound when the number is three. 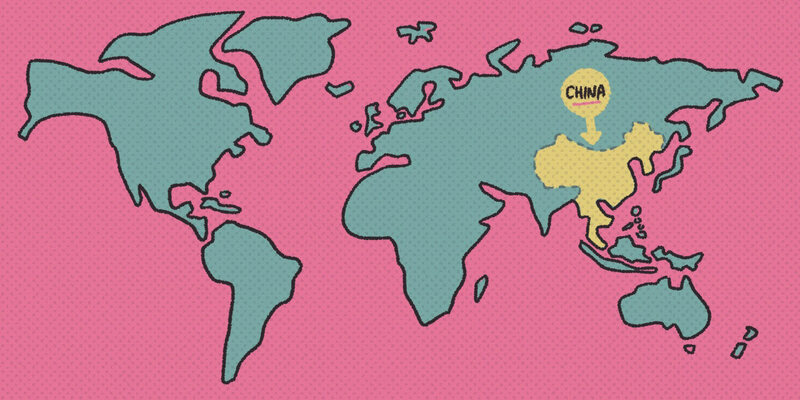 ４匹 gets a little tricky. Note that we have two options: the h-sound can either stay as-is or change to a p-sound. In the case of ４匹, it stays as よんひき. Down the column, you can see something similar for 8. In the case of 匹, ８匹 is はっぴき, not はちひき. Although the systematic reading changes table contains plenty of combinations we didn't cover, you should be comfortable using it at this point. It will mean you can help yourself when you encounter other counters. As a new student of Japanese, imagine that you wanted to use the correct counter for "tires." How would you find it? 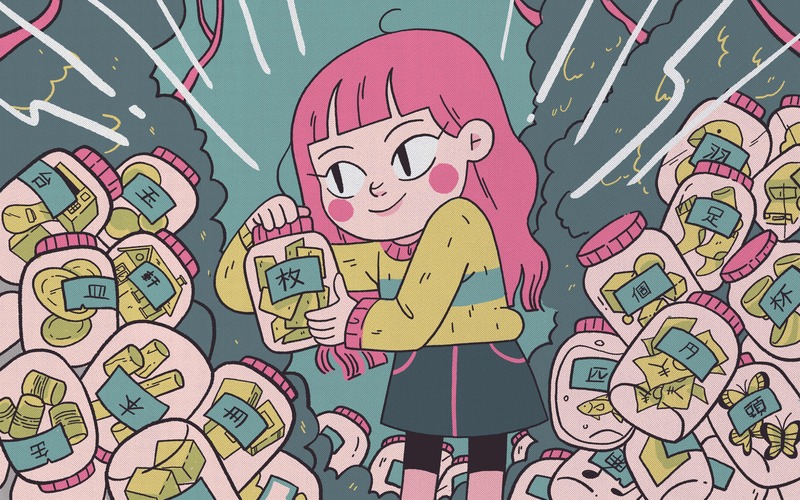 You wouldn't automatically know that it's 本 (ほん)—the counter for long, skinny things. Aside from having experience and gaining knowledge on the subject, you could turn to outside resources that can help. Let's look at a few. Although the website みんなの知識　ちょっと便利帳 is packed with interesting information, we're looking for the link to one page in particular: Benricho's ものの数え方〔助数詞〕 database, which translates to "Ways to Count Things (Counters)". It contains counter information for some 6,800 words, and its owners are still adding to it. We're pretty sure this is the largest Japanese counter database you can access for free. 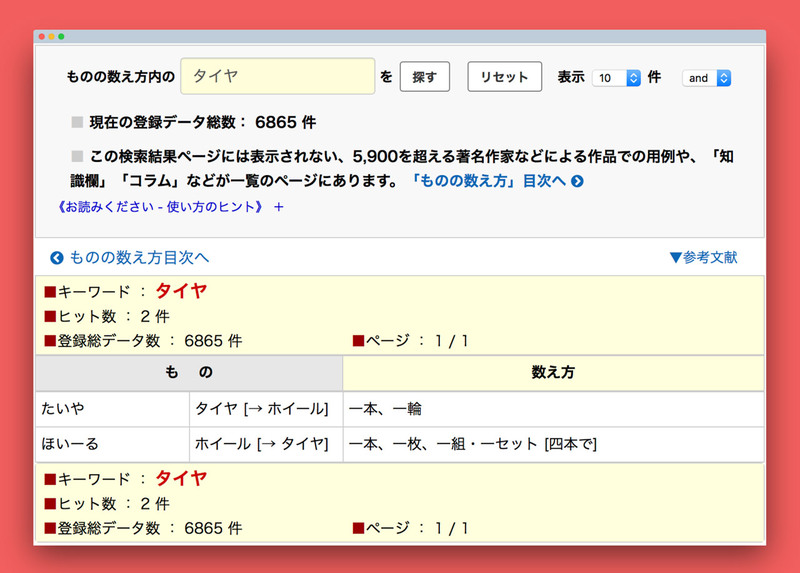 Using the site is simple: to start, type your word into the search bar, then click the 探す button. Say, for example, that you wanted to learn how tires are counted. 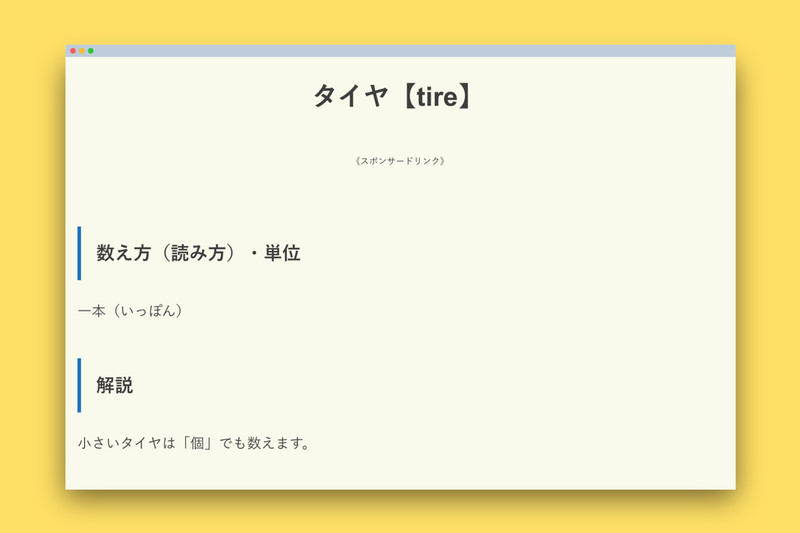 To do this, type in the Japanese word for "tires" and hit 探す. The results reveal a variety of information. Under the もの (things) column, you'll see a couple of results: not only does it give you タイヤ, but other related words, too. Notice that the search came up with both タイヤ and ホイール (wheel). To the right, you can see the 数え方 (counting method) for タイヤ is 一本 (いっぽん) and 一輪 (いちりん). For ホイール it's 一本, 一枚 (いちまい), and 一組 (いちくみ) and 一セット, which are only used when counting a set of four. The only remaining question is whether or not this information is useful to you. That will depend on how many counters show up as results as well as how much experience with Japanese and counters you have. Counting tires using 一本 or 一輪 is enough to get you started; if you used either one in real life, folks would understand you. And, there are places out there to help you to answer these kinds of Japanese riddles. If the first counters database doesn't cut it, the second-largest is the Counting Method Denomination Dictionary 数え方単位辞典. As of this writing it contains around 5,000 words. Its design is simpler compared to Benricho, and its items are categorized into groups, including "business," "fashion," "life," and so on. This could be helpful if, for example, you wanted to learn about the similarities and differences between counters for many different kinds of animals. The information here is a little different. Type in タイヤ, and only the 一本 counter shows up as a result. At first glance, it may seem inferior to Benricho because it has less data; yet for a new student, having fewer choices has its appeal. 一本 is more common than 一輪. With only the 一本 result, you don't have to worry about figuring out which one to use. On this site, note that some items might have extra information in the 解説 (explanation) section. In the case of タイヤ, it says 小さいタイヤは「個」で数えます, meaning "small tires are counted with 個." With that information at hand, you can read more about 個 in our 個 counter guide. Other sites list counters for specific words, but have less data and tend to take the form of lists. Some notable ones include the Sanseido Web Dictionary, the Sanseido Dual Dictionary, and the hyou.net ものの数え方 page. In general, you're better off using the larger databases and search functionalities of either Minna no Chishiki or Kazoekata Tani Jiten. At this point, you've learned a lot of generalities about counters and how to look them up. Maybe you've even taken a look at some of our individual counter write-ups. Now, let's go over some common patterns for counters in sentences—"Counters Grammar," if you will. We'll start simply and get more complicated from there. If you said 五匹が来た without any details, folks' natural response would be to ask "五匹 of what?" To start with, you have to decide whether a counter is self-explanatory or not. For example, if you say ５人, you know we're talking about "five people." You could say 五人が来た (five people came) and have all the information you need. But if you say ５匹, which means "five small-to-medium-sized animals, fish, reptiles, and so on," it's not clear what you're talking about. If you said 五匹が来た without any details, folks' natural response would be to ask "五匹 of what?" The counter 匹 isn't specific enough to provide context. For simple sentences in which the number+counter are themselves the subject or object of a sentence, make sure it can provide context on its own. I sent it in March. Then we know you're talking about X number of dogs. Once you know that, you can talk about what they're doing. I'll give Koichi a book. But hold on a second. You may be wondering what the difference is among all the dog sentences. The English translation has been the same throughout. Let's take a look. Translation: Five dogs showed up. 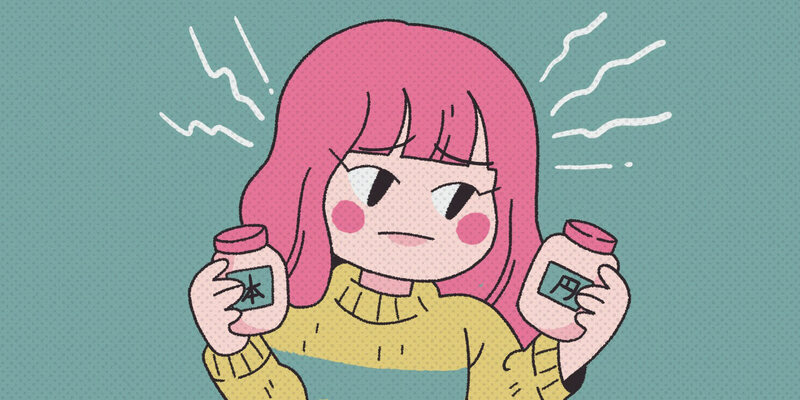 If you asked a Japanese person, it's likely they would think they were all pretty much the same. But let's get picky for a moment: first, the two sentences in which the counter is attached to the noun—５匹の犬がやって来た and 犬５匹がやって来た—are pretty much the same. But the one where the adverb counter is attached to the verb—犬が５匹やって来た—is different. The difference is that the first two are more specific. 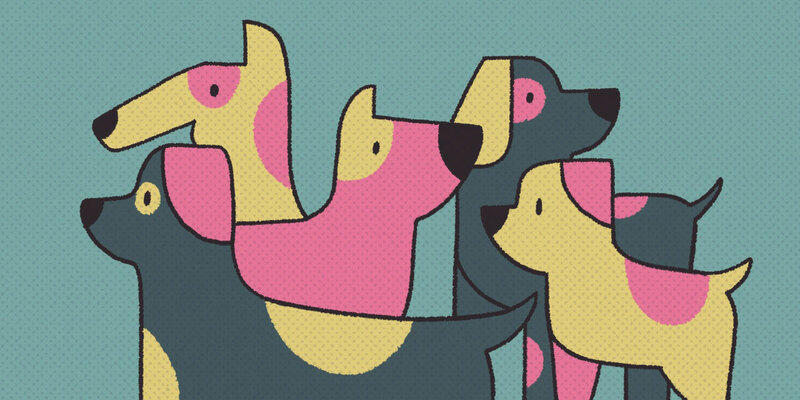 ５匹の犬 and 犬５匹 (subtly) suggest that those five dogs are in a group. 犬が五匹やって来た feels a little more like it could be any five dogs. Maybe there are a hundred dogs, and out of those hundred, five came over. That said, it's probably fine to use these patterns interchangeably with no negative effect as the difference is so subtle that you'll be relying on context anyways. We could continue to add more complicated grammar to these examples, but in the end it comes down to these two core concepts: using counters as adverbs and nouns. From here, it's just adding pieces; at their base level, neither the counters nor how they're used really change. More important is learning what counters there are and when to use them. By using and experiencing individual counters, you'll build your knowledge of grammar over time. For now, the basic patterns are all you need to know. You did it! You learned the fundamentals of Japanese counters! With this foundation, you'll be able to learn more counters more easily. We've put together some resources to help you. This way you can efficiently learn the counters that will help you the most… first! Instead of something to memorize, think of this part of your education more like a boost to the problem-solving skills you'll need as you become more fluent. This series of articles covers the foundations of counters: the (above) must-know ones, and some other common ones. Each article gives you a deep dive into the categories of things each counter counts, as well as example sentences and a thorough discussion of specifics. You're also given context and instruction for individual counters. Collectively, they form a powerful guide, smoothing your path through a potentially intimidating part of learning Japanese. Each counter is different. Instead of something to memorize, think of this part of your education more like a boost to the problem-solving skills you'll need as you become more fluent. If you need a recommendation on which article to start with, I'd suggest the ones about the counters 〜つ, 個, 本, 枚, and 台. 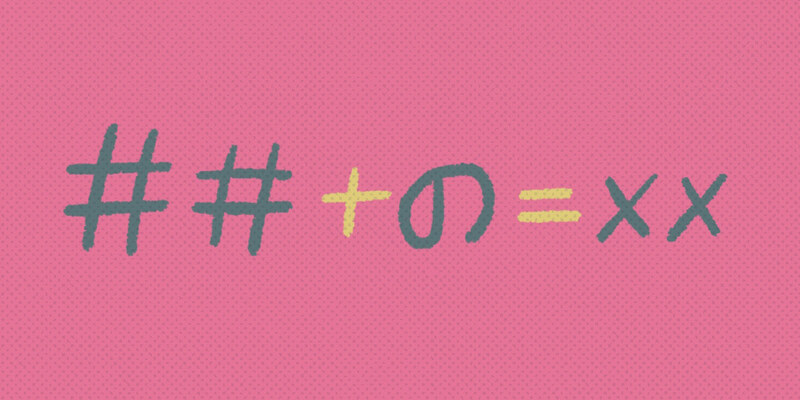 Also, be sure to read how to count in Japanese for some pre-foundational learning. Good luck counting things out there! 岸田泰浩. “日本語の助数詞について.” Osaka University. 1997. Tanomura Tadaharu. “Morphology of Numerical Expressions in Contemporary Japanese.” Nara University Repository. 2011. “List of English terms of venery, by animal.” Wikipedia.